Limited exhibit space remains at PowerTest 2017, the industry’s only electrical power systems maintenance testing and safety event, February 27- March 3, 2017. 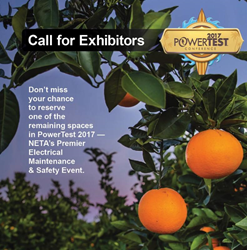 NETA, the InterNational Electrical Testing Association, is calling for companies interested in exhibiting at PowerTest 2017 to reserve their space before the trade show floor is sold out. PowerTest 2017 — North America’s largest gathering of professionals involved in the specifying, maintenance, and testing of electrical power systems — processes exhibit applications in the order received, and the exhibit hall is filling up. Over 1,000 participants will gather February 27- March 3, 2017, at the Disneyland Hotel in Anaheim, California for PowerTest 2017. The PowerTest Trade Show is open to attendees on Tuesday, February 28, 2017, from noon to 5:30 p.m. Attendees enjoy a complimentary lunch and engage with more than 100 top-tier electrical power vendors who share a mission for delivering safety and reliability solutions to everyday challenges. NETA hosts the only conference targeted directly at the electrical testing industry. There are no competing events or concurrent sessions. That means six hours of prime time with more than 1,000 attendees! Engage with the best-of-the-best in exhibitors and a gold mine of business development prospects. A limited number of exhibitor opportunities are still available for companies seeking leadership visibility at PowerTest 2017. NETA’s industry partners are encouraged to download the exhibitor brochure and reserve exhibit space as soon as possible. Additional information is available at http://www.powertest.org. Specific inquiries should be directed to Laura McDonald at 269-488-6382 (NETA) or lmcdonald(at)netaworld(dot)org. NETA is an ANSI Accredited Standards Developing Organization that creates and maintains standards for electrical maintenance and acceptance testing for electrical power equipment and systems, as well as a standard that addresses the certification of electrical testing technicians. NETA is an association of leading electrical testing companies comprised of visionaries committed to advancing the industry standards for power system installation and maintenance to ensure the highest level of reliability and safety.